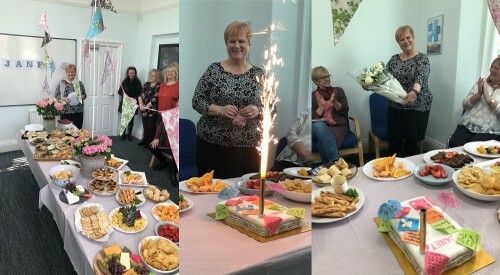 Friday 29th March 2019 marked the end of an era when Janet Flynn retired after nearly 27 years of loyal and dedicated service to Catholic Care. Janet joined the Charity in May of 1992 as a typist in the general office. Her skills soon shone through and she often helped Canon Maguire set out the Diocesan Newspaper, the Catholic Post. This led to many years of preparing leaflets, orders of service etc especially for the Good Shepherd Celebration. Many of you will know Janet for her HR role, a post she made her own in 1998. Here she became not the face of Catholic Care but the voice and ear of the charity, a very important confidant for employees. All week friends and colleagues called into the office to see Janet with cards, bottles and flowers. Each time the door bell rang it was a delivery of flowers and each time the phone rang it was another call for Janet wishing her happiness in her retirement. Friends, colleagues and Trustees also gathered to say farewell to Janet on the Thursday before she left for a shared lunch. Carol said “if there was anyone who lived and upheld the values of Catholic Care then Janet was that person. She certainly stood for Justice” and Father Rosser, who has been a Trustees for many years, thanked Janet for all her hard work and commitment to the Charity. It was a very moving lunch with Janet confirming that she had many happy memories to take away with her from her years at Catholic Care.